Pregnancy isn’t exactly a contagious disease. However, you might not know that from the way society has treated working women. In defiance of this bias, Amy Nelson, founder of co-working network Riveter, recently used social media to buck the “hide the bump” trend among women who happen to be planning the birth of both a business and a baby. Nelson received a raft of support for her willingness to pull back the curtain on the archaic notion that motherhood equates to boardroom uselessness. Despite the kudos for her in-your-face reality slap, many women who dream of rising up the corporate ladder or founding a company — whether or not they have an impending due date — remain less fortunate. Stories abound of female startup aspirants being shot down without a good reason. This is disgraceful. And it will take the support of other women to make it stop. Rather than simply achieve, women are distracted by obstacles they must overcome. It would be nice to think that, by now, bias against female leaders would have fallen by the wayside, so many generations after the first widespread women’s movement. Statistics show otherwise. Fortune reported that a paltry 2.2 percent of venture capital went to female-led startups two years ago. That percentage didn’t change one iota in 2018. The reason? Women are still seen as a liability because they might want to procreate or have a happy family life. Women have long fought to overcome the male-dominated business universe. Known as a pin-up girl in the 1940s, inventor Hedy Lamarr was first overlooked when she developed an early communications system. It could have supported Allied efforts in World War II, but the frequency-hopping system wasn’t used until the Cuban Missile Crisis in 1962. Lamarr wasn’t fully recognized for her work until half a century after her invention. Indra Nooyi is a more contemporary role model for working women; she also plugged away when she could have lost heart. Not only did she rise to the position of PepsiCo CEO (the company’s first female and first foreign-born CEO, as a matter of fact), but she drove the company to focus on healthier food items in line with consumer trends, despite criticism. Even with this success, Nooyi has publicly acknowledged that she struggled to give enough time to her family during her tenure. A LinkedIn letter she wrote after stepping down from PepsiCo contains a caution for others to learn early how to balance family and work because of the former’s importance. Certainly, the list of phenomenal female entrepreneurs is a fascinating rabbit hole to dive into and learn from. What often stands out in their stories, though, is that they needed to skirt rules, hide their femininity, or constantly fight to take the next step forward. It would be a much better working world if women didn’t have to focus so hard on jumping hurdles and could simply use their training and abilities to race to the finish line. That can happen. But it will take some conscious steps by other women who are already part of the business realm. 1. Encourage diverse funding streams. Getting money to launch an idea is notoriously difficult, particularly for women and minorities. To combat this challenge, BLCK VC was launched to offer funding streams to underrepresented entrepreneurs. Co-founder Sydney Sykes developed the minority-led company to increase investment resources and provide a community for the slowly-growing cadre of black investors. Sykes wants to bring attention to the lack of black funders in both black and non-black communities. In addition, she hopes to inspire other female entrepreneurs to bridge gaps in advancement when they see them. Everyone can use a cheerleader from time to time, especially women who may not have the traction or vehicles to get their messaging across. Kelly Hager, founder and CEO of Arras Sisters, plans to use her company as a platform to film and disseminate 104 unique documentaries featuring female entrepreneurs across the world. The women’s stories of achievement haven’t been heard because they’re working in their own silos, but these are stories worth sharing. The interviews will be compiled and sent to U.S. media contacts, with the aim of sparking TV and film opportunities for these entrepreneurs. As these women’s stories are amplified, their impact on the world will be, too. It’s past time to stop calling little girls who speak their minds “bossy.” We all need to be proponents of allowing women to go as far as they want in their careers and personal lives. This year, the Tory Burch Foundation Embrace Ambition Series concentrated on helping women own their professional desires. 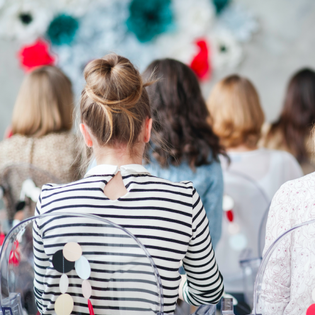 Burch’s free live-streamed series included the opportunity for participants to hear from keynote speakers who address the need for — and their belief in — female parity and prosperity. Women shouldn’t have to hide who they are in order to attain their career aspirations. The days are coming soon when seeing a pregnant CEO will cause no more of a stir than seeing a woman wearing pants. The faster those days arrive, the better off our economy and society will be.